There’s Knoll, Eames, Saarinen, Breuer, and then Alexander Girard, “the most famous designer you’ve never heard of” as dubbed by Vogue. He is most recognized for his festive and colorful textiles, though he was a true renaissance man who worked in architecture, typography, furniture, exhibition, graphic, and interior design. Born in New York City in 1907, Girard was raised in Florence, Italy and studied architecture in London and Rome. He later moved to Michigan and was the head of the textile division at the Herman Miller Company, where he had the freedom to express himself with primary colors, patterns, textures and graphics. He created over 300 textile designs during his tenure, ranging from wallpapers and prints to furniture and objects. One of his most notable commissioned projects was the legendary New York City restaurant La Fonda Del Sol in 1960. 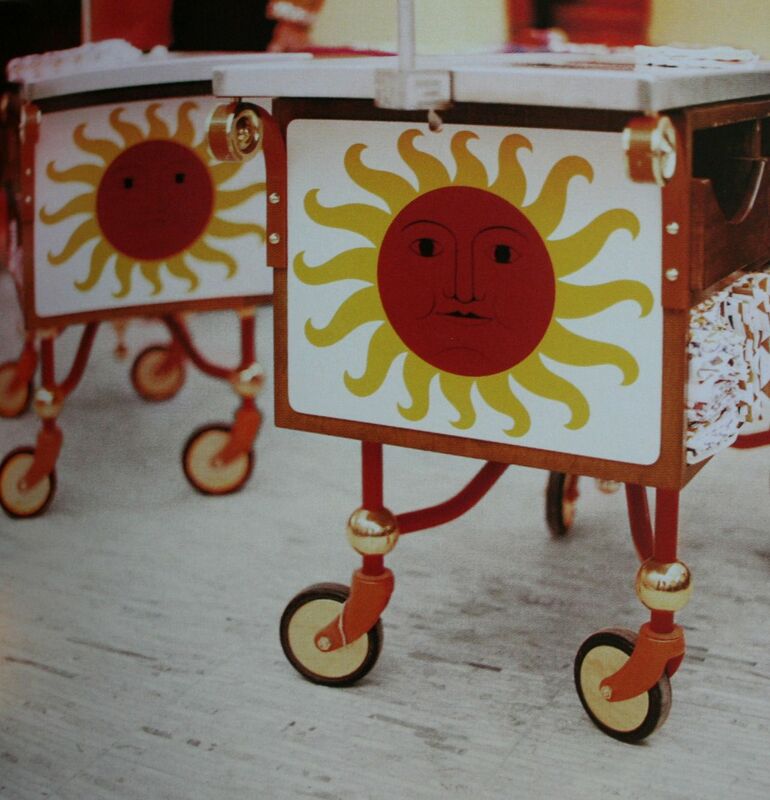 Girard used vibrant and animated sun-face motifs throughout the space in the Time-Life Building— from tablecloths and menus, to serving carts and paper wrappers on the sugar cubes. The swivel chairs were designed through a collaboration between Girard and his colleagues Charles and Ray Eames. It was a lively spot, the place you go for a three-martini-lunch, and was frequented by many well-known figures of the time (including Any Warhol!). Girard’s use of color, pattern and texture throughout his works was predominantly influenced by International folk art, which also contributed to his works’ “messages of love, joy, humor and cross-cultural understanding”, as described by his granddaughter Aleishall Girard. Through his expansive travels, Girard amassed a collection of approximately 106,000 “toys”, as he called them— 100,000 of which were donated to the Museum of International Folk Art in Santa Fe, NM. He designed a new wing at the museum to house the collection, and later produced a permanent exhibit displaying folk art scenes, which depicted a range human activities and experiences. Girard qualified his passion and shared his believe that, “…we should preserve this evidence of the past, not as a pattern for sentimental imitation, but as nourishment for the creative spirit of the present.” We feel the same can be said of antique and vintage furniture, accessories, Murano glass, and a host of other historical elements of design. They should be cherished and used as a means to unify the past with the present and inspire new ideas. Girard produced a truly impressive oeuvre over the course of his career, much of which is currently on display in the exhibition “Alexander Girard: A Designer’s Universe” at the Cranbrook Art Museum in Michigan. The seminal designer’s works will be on display through October 28, 2017. We’d love to go and escape the Texas heat!